The cool thing about a blog is that I get to write about life changing experiences and hopefully inspire others to join you in things that just don’t come along everyday. In this case it was my AimPoint Green Reading final certification weekend. Officially there are 18 more golfers on the planet that don’t have to wonder,”What the heck is this AimPoint stuff I keep hearing the Guru talk about? 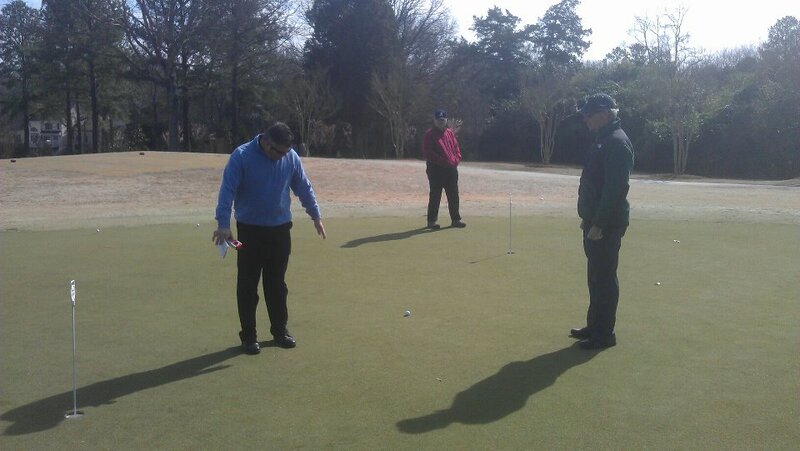 For the rest of you, AimPoint is a unbelieveable green reading system developed by Mark Sweeney that allow you to gather information, plug them into a chart and know “EXACTLY” where to aim in order to make every putt on the putting green. The cool thing is that anyone can do it with a bit of coaching and some practice of some basic skills. You may have seen the green line on Golf Channel that represents where the ball must roll at the correct speed in order for the ball to go in. Well now there is a teachable system that Mark has developed that can be applied to the average golfer to the tour player alike. I was introduced to this by my good friend John Graham and I am happy to say that I am officially a Certified Instructor to teach this phenomenal system. Mark came down this past weekend and spent some valuable time working with me on the fundamentals and how to apply it to the lesson plan for the students. Watching Mark read putts was like watching Picasso paint a picture. He was reading putts up to 60 feet in less than 25 seconds which is faster than most tour players read a simple 15 footer which sold me and my other teachers that with practice and some repetition, you can not only read putts with perfect accuracy but also faster than the old fashion squatting, plumb bob, walking around the hole procedure. Working with Mark was great as he was very willing to share any information that will help us teach this system to be the best of our ability. As he did the first clinic with my members, I soon found out why he is so successful. everyone had a great time and they were always engaging with so many good questions. As the putts started to drop, they were hooked and excited. 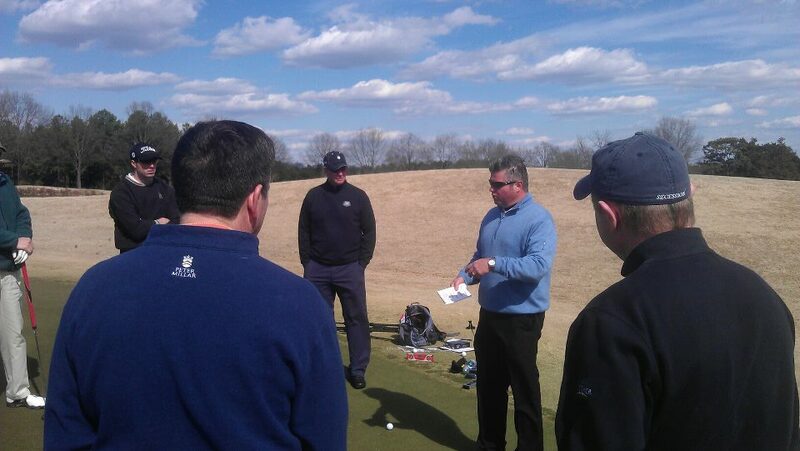 After I did my best Mark Sweeney impersonation in the second clinic, which was not even close I was so excited to be a part of this new and growing group of AimPoint Instructors. It is amazing that after so many years that this great game has been around that no one has even come close to developing a system that takes all of the guesswork out of one of the most mysterious parts of the golf, Green Reading! We should all be thankful to alive and have the opportunity to take part in such a game changing process. I am confident that you will start to see more of the games great players adopt this system in the near future. All I know is that we have 18 very excited golfers that will soon be #makingeverything. Feel free to contact me to come to your club to do a clinic by emailing me @jsutton@carmelcountryclub.org or hit me up on twitter @twitter.com/golfgurutv. ps. I think 7 or 8 of the participants in the clinic signed up because of my interaction on twitter. There is some ROI in there somewhere, lol. Special thanks to Mark Sweeney for allowing me to be a part of this prestigious group of coaches and to my friend, John Graham for all the training and extra time that he has spent with me over the last year. I promise to share the information as we are truly doing something that will grow the game. 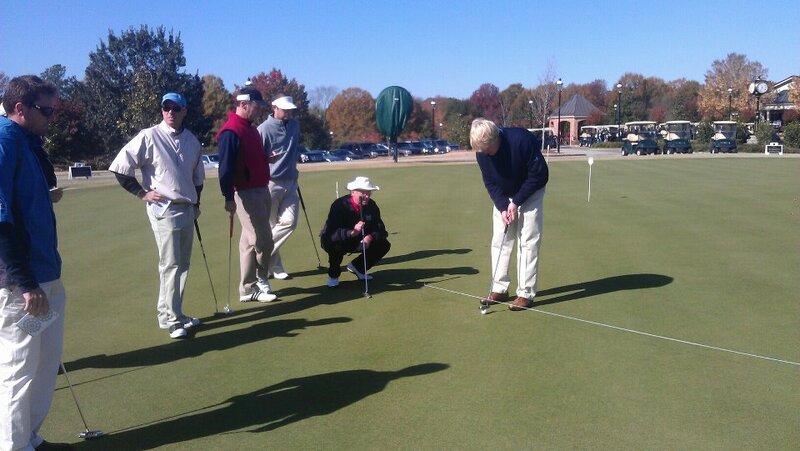 AimPoint Clinics At Carmel CC : Learn To #Make Everything! 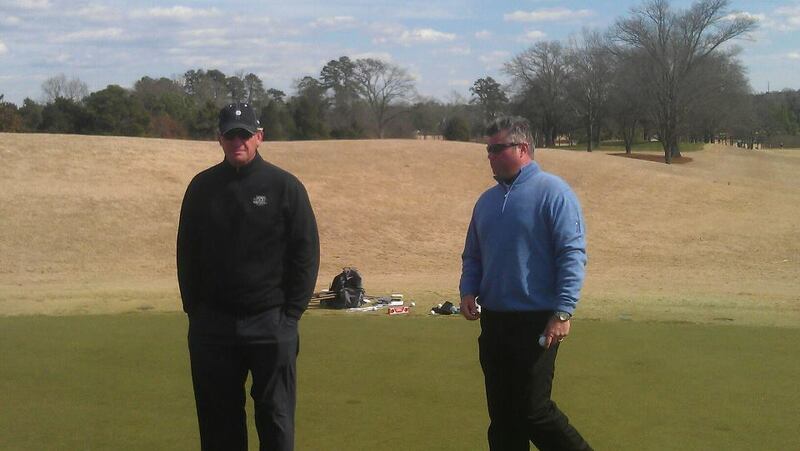 I will be hosting (2) AimPoint Green Reading clinics at Carmel Country Club on February 25th. There will be a 10:00 a.m. and a 2:00 p.m. session. I will be joined by Owner of AimPoint Technologies, Mark Sweeney so it will be a memorable day for everyone. Each session lasts about 2 1/2 hours and the cost is $200.00 per person. This would be a great way to get your year started out by learning the revolutionary green reading system that will change the way you look at green reading forever and help you make everything. Contact me at jsutton@carmelcountryclub.org to hold your spot. PRACTICE? What Do You Mean I Have To Practice? Big Thanks to @LiamPGA for the topic tonight. Be sure to follow Liam’s tweets on twitter. I was listening to XM radio the other day and the topic was, “What are the top reasons why golfers don’t practice?” I would love to hear your top 5 if you would leave them in the comment section. Some of the answers were 1. I only have time to play not practice 2. My wife complains if I am at the golf course for that long etc. You get the idea. I think it is primarily because 1. It takes commitment to change 2. Players don’t have a plan for improvement so they are just cementing bad habits and 3. Most people are impatient and quit trying if it they don’t see results right away. 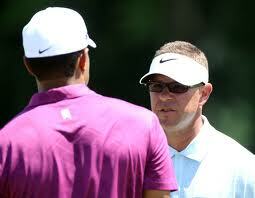 1. know what you are trying to accomplish get with your coach and discuss the keys until they are clear. If your coach can’t explain it so you can understand the what, why and how…….find another coach! 2. Use your mirror if it’s too cold or the weather is bad. Rehearsal swings with your eyes on it is the next best thing to a video. I caution you to not hit too many balls into a net without ball flight validation. Could be more harmful than good. 3. spend 60% of your time inside 60 yards and include putting. Search my archives and find the putting post I did on Putting Boot Camp for drills to include in your time..
4. Spend half of 50% of your time in mechanical mode which includes your workstation (see video) and working on changing your pattern. The other half should be practicing like your play which should include (a pre-shot routine, lining up to different targets, changing clubs and learning to hit different shots ( the 9 ball drill )…..Playing par 2 on the practice green with one ball to see what you can shoot. This is an area most golfers don’t spend enough time in so you can successfully transfer the skill to the golf course……Any Ranger Rick’s out there? Bottom line is that you can get some work done even if the weather is bad. Let me know if this helps motivate you to take a lesson and then go practice. There are No shortcuts to improving at golf. Talk to you tomorrow night. Tiger’s Swing Changes – Has the Student Been Left Out Of the Process? Or Is Foley Salesman Of the Year? I was recently asked by a friend of mine and fellow teaching professional of mine about what I thought of Tigers swing changes. This seems to be a hot topic in teaching circles since the sudden drop off of Tigers performance in the last year or so. Since the personal scandal that he has gone through, he has changed coaches (Haney to Foley) and now caddies (Williams to LaCava). I have set back and listened to everyone’s opinion on the situation and now I want to give you my two cents. As I understand the possibility of criticism from colleagues, peers and plenty of coaches that are way smarter than myself……I can take it! See as everyone focuses on Tigers swing changes which are vitally important and I will comment on, I want to bring another spin on things from a coaching perspective which is…..What does the student or in this case, Tiger….want from a ball flight perspective and from a past history angle. So here goes: I have posted 2 swings. 1 from 2008 and the other from this year to allow you to see the changes that Tiger and Sean have made. 1) The most obvious difference is the hand and arm plane in the takeaway. He is noticeably more inside with his hand and lead arm with the club more upright. In 08 his hands drifted away from his body with more forearm rotation with the shaft flatter at halfway back. As a coach I prefer this move as I spend alot of time fixing rollers and spinners of the shaft and club face. 2) the second change is with his arm plane/shoulder plane at the top and body pivot. Old Tiger had a flatter shoulder plane, higher arm plane and allowed his head to move behind the ball. The new changes are completely opposite. His shoulder plane is steeper, left arm is lower and head stays more steady at the top which from a coaching standpoint all matchup or what I call cancel each other out…..hope that makes sense. but the facts are: Tiger has always been too shallow on the downswing which lowering his left arm and moving more weight forward would seem to accentuate which makes no sense to me. He always seemed to play better with a higher left arm (which I know doesn’t fit the pattern) but its true. This kept the club more in front of him and on plane and also taller through the strike. So the question remains.” Has the student been left out of the process?” I hope not because as a big TDub fan, golf needs him to make a comeback and I would love to see it. I hope that team Tiger proves me wrong as if anyone could make it work, its Tiger. Remember, teaching is a moving target and it is our job as coaches and ambassadors of the game to figure out what our students need. If there was one way to move the club, they would all look the same……..And even the average bystander could tell that this isn’t the case. Comments are always welcome. 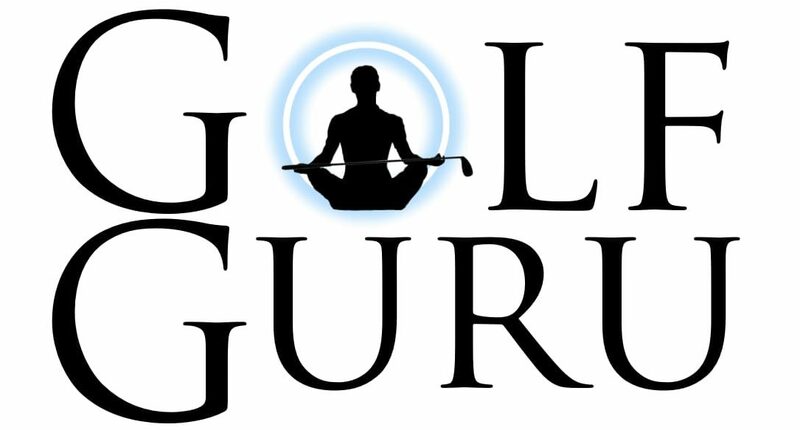 Guru …..I do teach non-members. 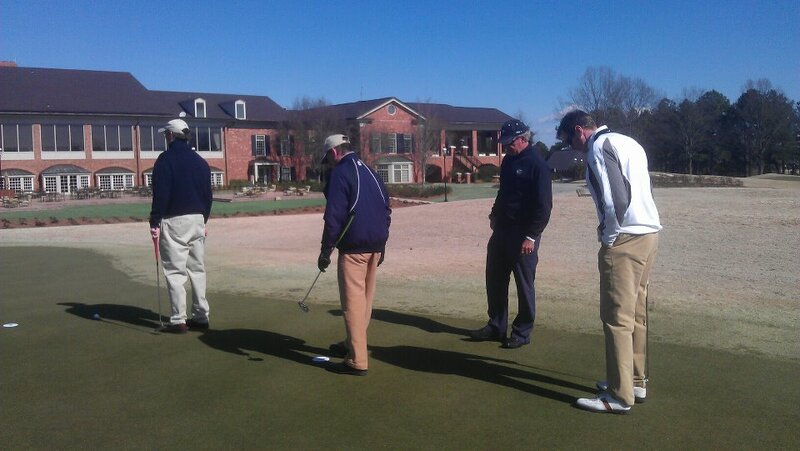 To schedule a lesson, simply call the golf shop @704-945-3300 or the learning center directly @704-688-9201. If you have my cell number, you know what to do! p.s. made it through my first week and loving my new gig. There are great things to come!